GREEN BAY — The good news is the Packers have CB Damarious Randall back in action today vs. Dallas. The bad news is fellow second-year CB Quinten Rollins is the one not playing now. Randall missed last week’s game with a groin injury and was questionable on the injury report this week, but he’s active and will start. But with CB Sam Shields (concussion) missing his fourth straight game and now Rollins (groin) out, once again the Packers are a little shorthanded in the defensive backfield. If Green Bay goes with the same plan it utilized last week, CB Micah Hyde will play the nickel corner position joining starters Randall and LaDarius Gunter, and rookie S Kentrell Brice will come in for the dime defense, with S Morgan Burnett playing the dime corner role. Rookie CB Josh Hawkins is also an option for the dime defense, but S Chris Banjo, out with a hamstring injury, is not. For the Cowboys, WR Dez Bryant, who was questionable with a knee injury, is out and will not play. RB options: The Packers have only one true running back active for today’s game in RB Eddie Lacy, with RB James Starks out and rookie RB Don Jackson still on the practice squad. Lacy was questionable this week after leaving last week’s game with an ankle injury, but he is active and will start. Green Bay’s other options for carrying the ball would be FB Aaron Ripkowski or WRs Randall Cobb and Ty Montgomery, all of whom have carried the ball this season, though not regularly. That trio has combined for nine rushing attempts this season, with Cobb leading the way with five. Big day in the NFC: With the first-place Minnesota Vikings on their bye, the Packers will end the day either one or two games back in the NFC North race. In the overall NFC picture, four one-loss teams are playing one another in the Cowboys-Packers and Falcons-Seahawks matchups. So, at the end of today, the conference will have just two one-loss teams left, or three if the Eagles can rally to beat the Redskins (Washington was winning in the third quarter at the time of this posting), on the heels of the unbeaten Vikings. 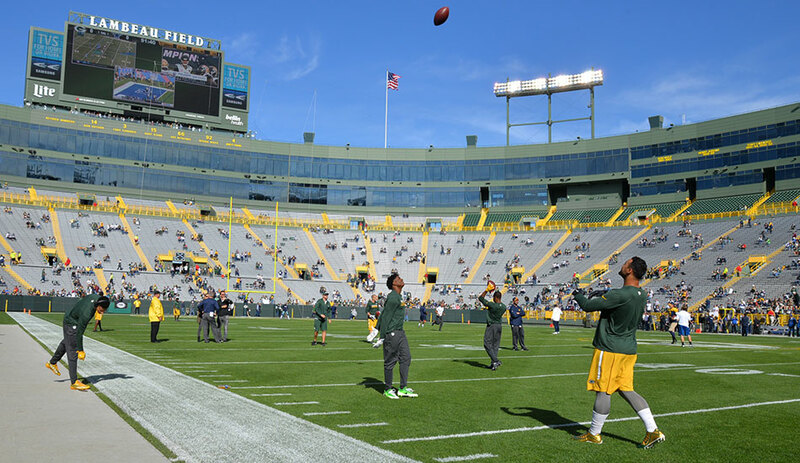 Weather update: It’s a beautiful late afternoon in Green Bay. Temperatures at kickoff are expected to be in the 60s, perhaps dropping into the high 50s later in the game. There’s no chance of rain and winds are light. 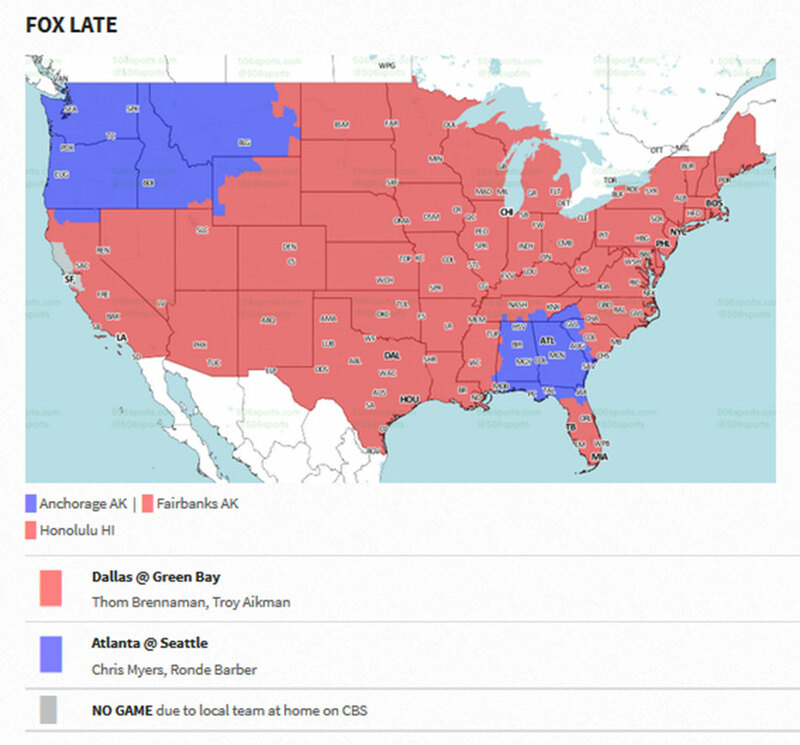 TV map: Here’s the FOX TV map for the late-afternoon broadcasts, courtesy of 506sports.com.